At the Atlantic Medical Clinic, we treat many people for Atlanta neuropathy treatment. Since we are an integrative practice, we use both medical and natural modalities to help our patients recover. However, additional lifestyle recommendations and remedies implemented at home can be helpful too. This way, you can achieve maximum comfort and quality of life without the overuse of prescription medications. If foot pain is one of your neuropathic symptoms, make sure that both your shoes and socks are loose-fitting to ease the pressure and allow for optimal blood flow (1). Additionally, ensure that your feet do not have any calluses or blisters. Per the National Institute of Health, one of the primary ways an individual can treat neuropathy is to stop smoking (3). Smoking causes vascular constriction, which in turn prevents vitamins and minerals from making their way to your extremities. Aerobic exercise – such as walking, swimming, or cycling – should be performed for a half-hour at least every other day, though you can work up to that amount if you are out of shape. The other categories of exercise are more specific. Our physicians can be of help in this regard, but the Foundation for Peripheral Neuropathy outlines a few suggestions (4). The Mayo Clinic notes that enhanced blood flow and neural stimulation can be effective at treating peripheral neuropathy (5). Massage can meet these aims. Since working with a professional can be cost-prohibitive and inconvenient, self-massage (or massage by a friend or loved one) may be a viable alternative or addition to a licensed therapist. Peripheral neuropathy (PN) affects thousands of people throughout the United States, so you are not alone. We can also help, with a comprehensive evaluation and customized treatment plan, so you can reduce pain and receive treatment with the highest quality professional care. Having both conventional and chiropractic methods at our disposal, the Atlanta Medical Clinic can guide you back to a full and active lifestyle. We all experience pain, but how does it work? Why do we stub our toe or strain our back and feel it, almost immediately, in our mind? Of course we understand that the brain is the central processor of our nervous system, but the specifics of how pain is felt in the brain is more complex than you might imagine. Below are five aspects of the human pain system that you might not know, followed by an assessment of how pain management can provide pain relief. 1. The brain does not provide the pain reflex. Neural tissue within the spinal cord reacts to the pain and tells the involved part of the body to remove itself from the situation. It is an automatic reflex occurring without the brain’s involvement. Areas of the brain that previously experienced the pain are re-stimulated. This pain memory partially determines the body’s physical and emotional response. Additionally, pain is increased or decreased due to the memory information obtained. This applies both to chronic pain and re-injury. An example of pain that is often chronic is neuropathic pain. a. Fast pathway – sharp and immediate pain. This route to the brain hooks into the thalamus. Then A-delta fibers transmit the signal to the cortex’s sensory and motor components. The fibers, which also send temperature information, are myelinated. The myelination speeds up the pain signal because its insulation focuses the transmission, because the action potential jumps from node to node along the fibers, and because depolarization allows the signal to travel with less energy. b. Slow pathway – dull and prolonged pain. C-fibers, which are not myelinated, become activated when pH levels drop and certain chemicals are released. The C- fibers send an electrical impulse through the dorsal horn to the spinal cord. 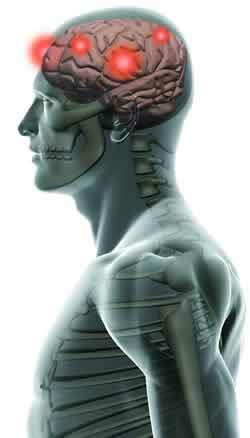 This pathway allows the brain awareness of an injury that has not healed, i.e. chronic pain. It keeps the body from conducting normal physical activity, reminding the brain of the damage. Emotional pain processes through the slower response system, the C-fibers. We tie certain emotions to the pain because it is such a continual aspect of our brain functioning. Emotions related to pain are mediated through the prefrontal cortex and limbic system. Nociceptors, also called free nerve endings, are neural axon terminals that connect to the spinal nerve. The two types of nociceptors are the fibers discussed above in #1: A-delta fibers and C- fibers. Pain management seeks to provide alleviation for pain so that individuals can operate effectively and lead normal, active lives. Pain relief can help to treat any type of chronic pain, including neuropathic pain. Integrative pain management can involve the combination of injection based treatments and chiropractic manipulation. Atlanta Medical Clinic, through this integrative method, seeks to diagnose what is causing the pain (the part of the body affected and the central source of the problem) and then manage it via rehabilitation to stop the continuous or recurring pain cycle.